Cupcakes 'n Daisies: State of Grace . . . . Thanks all for providing such wonderful feedback on my block choices for Toulouse! It appears #2 was the most popular choice. I was pretty much sold on #1, but I'm a control freak, you've convinced me that #2 really is the best use of the fabric that I have. As Cathy commented, it's "controlled scrappy", which suits my need to control but mix it up a little. So as you're reading my blog this morning, I'm in a plane heading home from California. My husband needed to run out there for business, our daughter lives in downtown Los Angeles so I figured I would tag along..PLUS I got to attend the "Road to California" quilt show. Other than getting to hug my daughter anytime I wanted, the weather was the best part of this trip...it's been in the 60s and 70s. It was 0 when we left Illinois. The temperature felt balmy to us but the folks in downtown LA were wearing winter coats...nice winter coats, but a t-shirt worked for me! I planned to show pictures from the quilt show on my blog today, but I forgot to grab my camera on the way out the door to the show!! My husband was getting ready for a meeting, my daughter was getting ready for work, and I was wanting to hit the road to miss the morning traffic, all this in a small one bedroom apartment. I'm lucky all I forgot was the camera!! I so enjoyed the quilt show, and did pick up a few items which I mailed home instead of paying for an extra bag on the plane. I'll blog about those when they make it to my home. So instead today I would like to blog about "State of Grace". I bought this kit from Lisa when she was having a spring cleaning sale, I think the fabric, Shangri la by Moda, has been out for a year or two. If you purchased the jellyroll in the cute little purse, you got a free pattern. State of Grace! 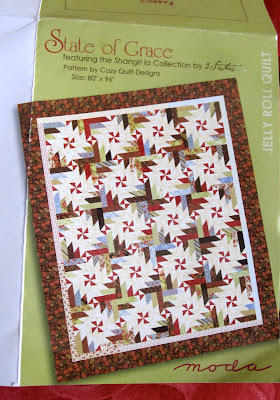 I've always been partial to pinwheel quilts so I was excited to get this kit. 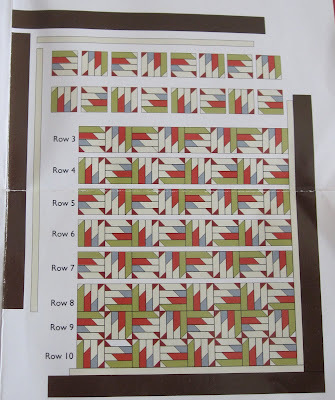 When I studied the pattern, I discovered that the blocks were assembled in what I think is a complicated and tedious way to make pinwheel blocks, but then I've never made a pinwheel block. Plus this pattern requires 80 of these blocks! Is this the best way to make a pinwheel quilt? Keep in mind that I'm working with a jellyroll. This is how the 80 blocks are connected to make the pinwheel pattern. So what do you think, is this how I should make this top? I think the tedious part is drawing that darn diagonal line over and over again . . . I was having the same problem this weekend because I decided to make the Xmas tree quilt that Nicole showed on Sisters Choice . . . I found the pattern on the internet . . . but drawing those darn diagonal lines was driving me crazy . . .
then I played with my 1/2 square and 1/4 square rulers . . . and now I'm just cutting my strips with the diagonal already there . . . the sewing is going like a dream now . . .
probably everyone already knows this . . . but I'm still learning . . . LOL . . .
Eleanor Burns has a quick and easy way to make "delectable mountains" which MAYBE could be used for this... I would have to study it further... she makes a large half square triangle, then cuts it into four or five segments, parallel, then rearranges them for that "sawtooth" effect. I hope you had a wonderful time in California! I saw that pattern not long ago in one of my books (well something close to it). I will attempt it someday! The jelly roll colours are beautiful! Love the fabrics! If you find an easier way let us know...I hate drawing those annoying lines! I know you will figure it out :) and have it made next week! I think that is a very tedious method, but I can't really think how else to do it with a jelly roll. And it shouldn't be very hard, just boring, kind of like making binding. Worth the effort in the end, but boring to do. I was so sad to miss this one, I can't wait to see yours finished! Ooh, that pattern reminds me too much of the tessellations quilt I made once. The sewing was easy, but it is the layout that gave me fits. The finished results are fantastic, but I nearly went crazy putting it together. Hey Thelma, how nice to have a quick visit with your daughter!!! I have some of the Shangri La fabric. It's really pretty. Can't help with the pinwheel question as I haven't made them either. PS I Quilt is having a quilt along but the instructions aren't up yet. I'm sure you will figure it out in a way that is best for you. FYI, I nominated you for an award on my blog. 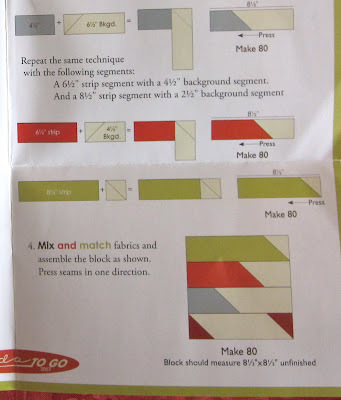 I think you're limited in how you can build the block because of the jelly roll strips. I hope you can figure out some shortcuts! I just received this jellyroll in the cute little purse. I was wondering if you found a solution to the tedious line drawing and if you made this quilt. If you did would you please give me some tips? I am glad that you enjoyed CA. It is where I live & I love Road. What a show! I am anxiously awaiting your answer. Have a great day.